The huge bowl of clam chowder at Mo’s is a great deal at $12.50. It will easily feed a family of four. The free soda refills are a treat for kids who hardly ever get soda. Having to stop at a Dairy Queen and buy four Dilly Bars on the drive home in order to use the bathroom is not a good deal. Free soda refills should come with their own bathroom. When your expensive hotel rooms smells weird, talk to the management. You might get $20 knocked off your bill. I really enjoy looking at old farmland from the inside of the car. I especially like looking for old farm houses. They’re usually surrounded by enormous old trees, planted long ago as wind breaks. The Subway restaurant in Roseburg, Oregon is right next to a Goodwill. My husband can be tricked into stopping there. The Goodwill in Roseburg, Oregon is just as overpriced as the Portland locations. There is nothing to lose by letting a 12-year-old be the “navigator” in a paddle boat. You just have to accept that you will go in circles and meander a bit. Kids quickly get bored with Forest Ranger talks at Crater Lake. Adults like Forest Ranger talks at Crater Lake. It’s important to pay attention to a car battery that dies after just a few minutes of having the lights on while the car is off. The Les Schwab Tire Center in Sandy, Oregon has wifi. All the cookies brought on vacation will get eaten within two days of vacation. Watermelon can go from Portland to Crater Lake to the beach and back home again without complaint. The Sea Lion Caves consider children 13 and up to be adults. The Sea Lion Caves had only three sea lions today. That’s $14.67 per sea lion. When staying in a steeply sloped “A” frame cabin, it’s important to sit up slowly while in bed. Chipmunks will beg to be fed, and will eat granola. Chipmunks are so cute that you will gladly sacrifice a couple handfuls of granola. 51¢ squished pennies are the perfect souvenir. It’s good to be home, but it’s actually better to be in a cute “A” frame cabin without internet, phones or worries. It’s still good to be home. I love Oregon! Sounds like you guys hit a lot of spots, and now I’m glad we decided against the sea lion caves when we were there last month. We also started doing the squished penny souvenirs. 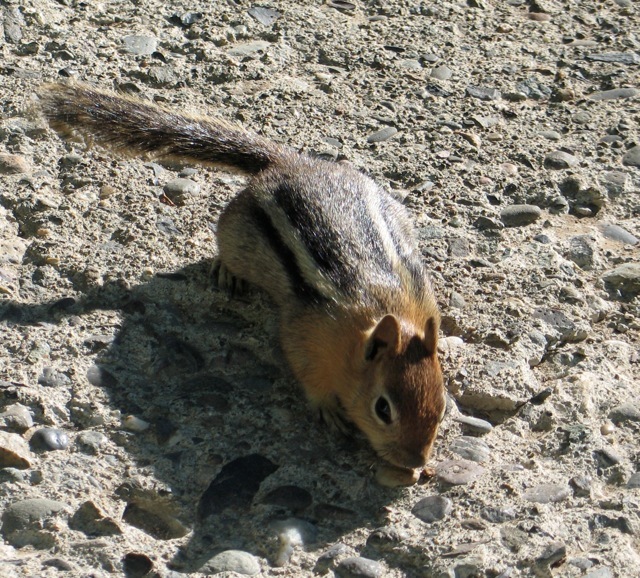 Here’s two more tidbits for ya: that’s a golden-mantled ground squirrel in your picture (for easy reference, chipmunks’ stripes continue onto their face), and they carry fleas which can spread disease and ought not to be coaxed close to people with food. Sea Lion caves are definitely a rip-off. Fun post! Yeah, my sister was quick to point out the error of my species identification as well. Still cute, especially since I was not trying to do any gardening while on vacation. Do chipmunks carry fleas? Now, I have to figure how to get close to one of my critters on purpose to examine the face. Whatever I have digs up any plants I have, bulbs too. Children do not get bored with lectures in the Okefenokee Swamp, especially when they are riding in a tiny boat looking for alligators. However, the mother was terrified an alligator would actually want to eat one of the children. Danger or dangerous animals in the lecture or environment keep children entranced and mothers nervous, too nervous to focus on information. I was laughing over the smelly hotel room. Once upon a time, my two sisters and I decided to get out of town, just the 3 of us, and we ended up in a funky motel in Capitola, Ca. We didn’t get to bed until really late, we were having so much fun. So it was midnight before we pulled down one of the funky beds, a Murphy bed, from the wall. Turning the bed down, we noticed they had definitely been used by an amorous couple who had earlier spent time at the beach, by the evidence. We called and called the “Manager” to either change the bed or even send up some clean sheets. No answer. We gave up and swept off the bed and put towels down on the mattress because by then we were exhausted and needed to go to sleep. In the morning, my oldest sister swept into the manager’s office demanding a reduction in our rate due to the dirty bed. I guess it says a lot about how she ran the place, because she was unfazed. She wouldn’t take money off the rate but offered us a free room next time around. Yeah, right, we wanted to return to a place that was badly maintained and where no one answered the phone. My sister was still muttering imprecations at the manager as we packed up and drove away. Annoying then, but we all laugh about it now. I ALWAYS remove the bedspread on motel beds for that very reason. I agree, 51cent squished pennies are the best souvenir ever! Luckily my 9 year old feels the same way and has gathered quite a selection over the years. They are cheap, small, and don’t produce more waste that meerly gets thrown away a few months later. She loves going over her collection and is reminded of fond moments and even some not so fond such as smelly motel rooms! Our collection of squished pennies is growing too, love that souvenir!! 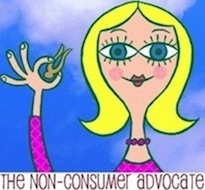 Means we can by pass the spendy items and get something fun and easy to carry. Sounds like you had a great vacation. We loved our last road trip to Crater Lake. Kids had the most fun when we stopped off at the Oregon Vortex & House of Mystery, a surprise to them. Kept them entertained the whole time, they took loads of pictures of each other tall-short, short-tall and still talk about it. Real good bang for your buck for our nerdy family. Sounds like fun. Did you know the African Safari Wildlife Park in Port Clinton, OH thinks that ages 7 and up are adults. Very odd.